Turkey's foreign minister says Europe has failed "the solidarity test in the fight against terrorism" following last month's car bomb attacks in Istanbul. 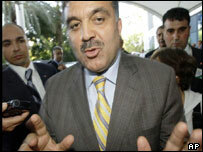 Abdullah Gul said many of the prime suspects were still abroad, but intelligence was not always shared. He warned European leaders that if their countries were attacked "everyone will think twice before co-operating". Speaking to the local NTV news channel, Mr Gul praised neighbours Syria and Iran for supporting the investigation. Syrian authorities handed over 22 suspects to Turkey on Sunday. Following two days of questioning, 20 of them were released while two remain in custody. Mr Gul said that both he and the Prime Minister Recep Tayyip Erdogan would raise the issue of sharing intelligence at the coming EU summit in Brussels. He said they would give the message that "European countries should not distinguish between your terrorist and my terrorist". We will try to give the message that European countries should not distinguish between your terrorist and my terrorist. Mr Gul also promised to increase their emergency security measures to prove that Turkey is safe again. For weeks, there has been a strong reaction in the country to what has been interpreted as "Western attempts to isolate the country". They include the UEFA's decision to move two Champion's League matches from Istanbul due to security concerns, travel warnings issued by England, Germany and other countries, as well as visa restrictions on Turkish nationals wishing to travel to Britain. The Turkish government has condemned these measures as a "victory for terrorism." Prime Minister Erdogan also criticised Britain for not sharing intelligence on future attacks, when the British government warned its citizens that future attacks were "imminent". Ankara says that following the attacks, Iran and Syria co-operated to an extent "that wasn't seen in the previous years." In the past, Turkey accused Iran of trying to export its regime and masterminding several high-profile killings. These accusations were not repeated after last month's bombings on two synagogues, a British bank and the British Consulate in Istanbul. Relations with Syria remained tense until the late 1990s, when Turkey threatened military action against Syria over its hosting of Turkish Kurd rebels. Syria expelled rebel leader Abdullah Ocalan in 1999.